Security is a high priority within Industrial IoT projects, but it is advancing like the rest of the industry—inconsistently, with big gaps between the leaders and everyone else. That isn’t unique to one or two industrial segments. It applies to all of them, and even to slices within particularly industries. Hirsch should know. He helped to develop the security framework the Industrial Internet Consortium (IIC) published earlier this year, and has been involved in in standards-development working groups on privacy and security at OASIS, as well as IIC. He also co-authored a white paper outlining a security maturity model for the Industrial IoT, which was published recently by the Industrial Internet Consortium (IIC) (PDF). It’s not just the number of industries that’s confusing, though. In June 2017, IoT Analytics counted a total of 450 software vendors. A McKinsey & Co. report, released the prior month, came up with only 150 or so, after eliminating some for being incomplete even in their own categories. “If there are [even] 100 IoT platforms, then there is no platform, just aspirants,” the McKinsey report concluded. It also issued a warning that the market eventually would have to boil down to just two or three leaders. That may not happen any time soon, given the number of vertical market categories, and the likelihood that some platforms will play better in some industries than others. But 450, or even 150 is far too many for either technology providers or customers to track, especially without standards that would make migration, management, security and everything else easier to handle, according to Asaf Ashkenazi, vice president of IoT security products for Rambus Security. That is not unusual according to Cisco’s 2018 Security Capabilities Benchmark Study, which showed that devices without permission to be set up are allowed onto networks anyway, by organizations that just assume what they are and that whatever they’re doing is legitimate. The “endpoint visibility gap” ranges from 12% for government agencies, 33% for healthcare organizations, 43% in technology companies and 50% in finance. Unfortunately, there is very little consistency in the level of functional capability from one developer to another, and even less consistency in their awareness or ability to create secure networks of IoT devices,” according to Gerardo Pardo, CTO of Real-Time Innovations, who co-wrote the Data Distribution Service (DDS), a secure, machine-to-machine middleware and Object Management Group standard that provides high-performance, real-time data exchange on a publish-subscribe basis for financial trading applications, air traffic control and other latency-sensitive, device-dependent applications. “Some vendors have very comprehensive security practices and really understand what the problems are and have comprehensive solutions to the problems,” Pardo said. There is already an alarming amount of mystery about the hardware people are installing, Ashkenazi said. That doesn’t help organizations building IIoT networks, which often are developed without understanding the difference between the relative security and isolation of supervisory control and data acquisition (SCADA) systems. Moreover, those networks frequently utilize automation software that was not designed for access through the cloud or across the Web and the new IIoT architectures they’re jumping into. Integrators or developers accustomed to physical isolation or non-standard networks, or limited network access or other forms of isolation common to traditional SCADA systems, may not understand the risks at each layer of the network when they try to migrate to the cloud or add web-based access. Rambus addresses the problem with a service called CryptoManager IoT Security Service, which provides a device-to-cloud security service using a platform as a service provider on the server side and, on the client side, a software development kit that includes chipset and client software support. All of this can be adapted to a variety of devices and use the root-of-trust and authentication capabilities to create a secure base. It is a turnkey solution aimed at service and technology providers, and Rambus licenses its implementations of DDS to companies including Mentor, a Siemens business, which pre-integrates it as a communications layer. Standards such as DDS allow authentication with standard protocols, access control, and transport using almost any networking protocol. They also offer support for vendor-agnostic communications methods such as the IIC’s Internet Reference Architecture, which Real-Time Innovations helped develop as a member of the IIC working group. However, preventing a breach isn’t a high enough bar to set for a security model that defines maturity, Hirsch said. And because the IIoT involves both operational technology and information technology, any maturity model has to include elements of both. The highest priority of many operational technology systems, according to the report, is to avoid causing injury or death, followed by the need to avoid putting the public at risk or causing harm to the environment. 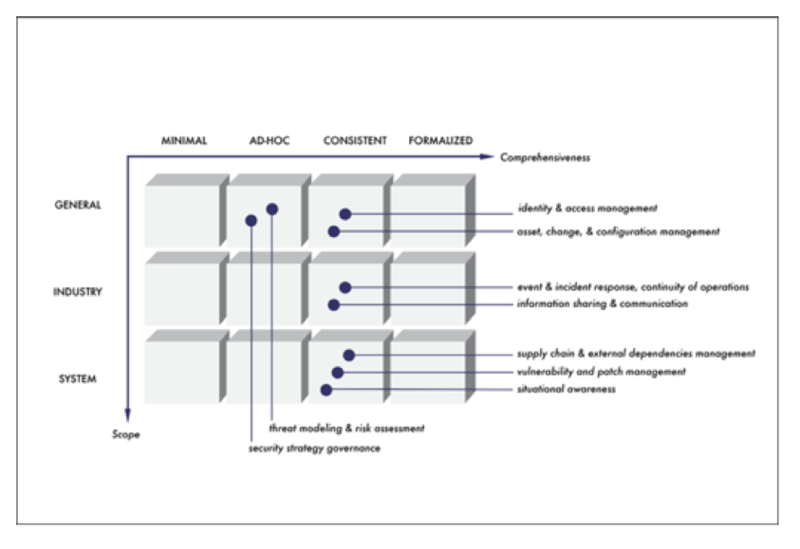 The rest of the model is designed to highlight elements of trustworthiness, as well as safety by including such things as coordination with other departments or organizations and communication of risk and priority. This is not just about identification of threats, though it does cover security models and elements, including how to secure endpoints. The goal is to create a broad framework, not to confine it to one technology or one aspect of information security and burrow down from detail to minutiae, according to Stephen Mellor, CTO of the IIC. The problem is so enormous that it’s difficult for people to grasp in the first place, and even more difficult to determine how to deal with it.